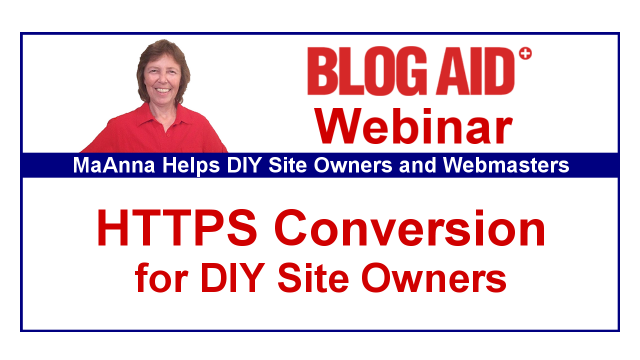 Join me live for a fun, non-geek-speak chat on what’s involved with converting your site to HTTPS and about SSL certificates. NOTE: The time is a little earlier than usual to accommodate more of my European clients. A replay will be available for a limited time. Please do let all of your peeps know about this free webinar! I appreciate you helping me help more DIY site owners make good decisions and avoid getting ripped off. Just a few days, Karen, until midnight Tuesday, and only for those who register. Is it possible to catch the replay (and get the checklist) if I missed the window to register ahead of the live webinar? I clicked the button to Register Now, but just see a notice that the webinar has ended.